Load In / Set-up information for Vendors – Please read!!! Oddmall is less than a month away! Things are really coming together to make this a great show. Here is some information for you to help you in your planning. The Edward D. Hanson Conference Center is located on the corner of Broadway and Hewitt Avenue adjoined to the Comcast Arena. The Conference Center has a loading zone in the front of the building that will be reserved for vendor load in on Friday from 12-5 and Saturday from 8:30-10:30. We will have people available to assist you with your items. A limited amount of carts will also be available as well. As we have over 130 people who need to setup, we ask that you pull up, unload your vehicle and then park your car. We will have people available to keep an eye on your items until you park your car. Parking is available in several parking lots and garages within walking distance. If you are staying at the Holiday Inn, you can park at the Holiday Inn and take the free shuttle to the convention center. If your booth is on the second floor (The Main floor) (Booths 1 – 110). If your booth is on the second floor you are encouraged to set up on Friday May 30th from noon – 5pm. Set up is also available on Saturday May 31st from 8:30am – 10:30am. The conference center will be locked and secure over night. I will be the last person to leave on Friday and they will not let anyone in on Saturday until I arrive. If your booth is on the first floor (Booths 111 – 131). We were unable to get the lower level on Friday, so you will have to setup on Saturday Morning between 8:30 – 10:30. We are also offering a vendor special on our official event T-Shirt. They are $25.00 at the show, or you can pre-order yours for $20 and we will give it to you at the show. Use the same form to order your shirt. This is the design on the shirt. It will be printed on a white shirt and is available in a variety of sizes. You are required to be in your booth during show hours. Early tear down is not allowed. Your booth must remain open until 6pm on Sunday. We encourage you to bring a booth buddy to Oddmall, If you can not,we have a group of volunteers who will be available to watch your booth for you for 10-15 minutes while you get something to eat or use the restroom. October Show – Booth Sale going on now! We have begun selling booths for our return to Everett on October 4,5 2014. Booths are on sale for up to $75 off if you sign up by May 31st. We will be in the same location, and our neighbor that weekend in the Arena will be The Ringling Brothers & Barnum and Bailey Circus. Huge crowds all weekend are expected with 2 performances daily during Oddmall. In addition to our regular marketing channels, we will also be promoting this show as our Circus Edition. 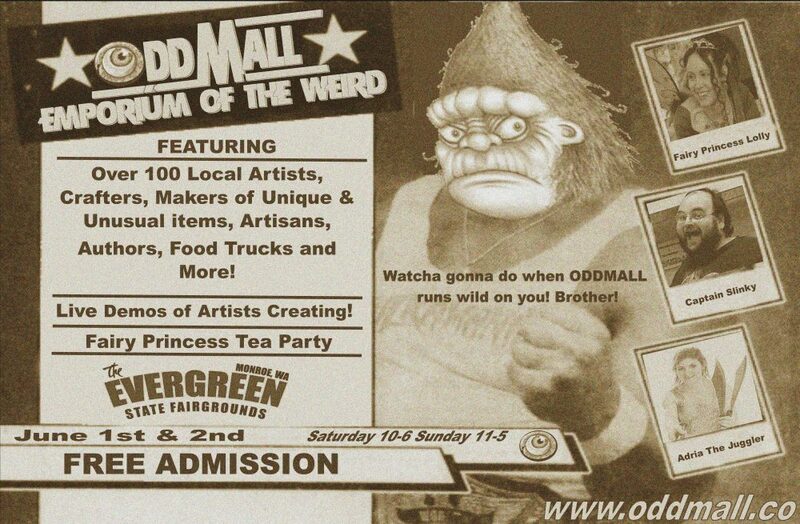 Come to Oddmall before or after the circus! The circus draws between 8000-10,000 people per performance. We should be able to engage a good portion of these people at Oddmall. We are also offering our Starving Artist Payment program for this show. Split your booth into 3 payments and reserve now with a $50 deposit. I hope you have a great show and enjoy all of the fun things we have planned for Oddmall. We are glad to have you as a part of the show. If you have any questions, please do not hesitate to ask.